A bullet journal is a a to-list, a planner AND a diary. Essentially, you jot down lists, ideas and thoughts in bullet form. Ideally, using a dot matrix notebook. 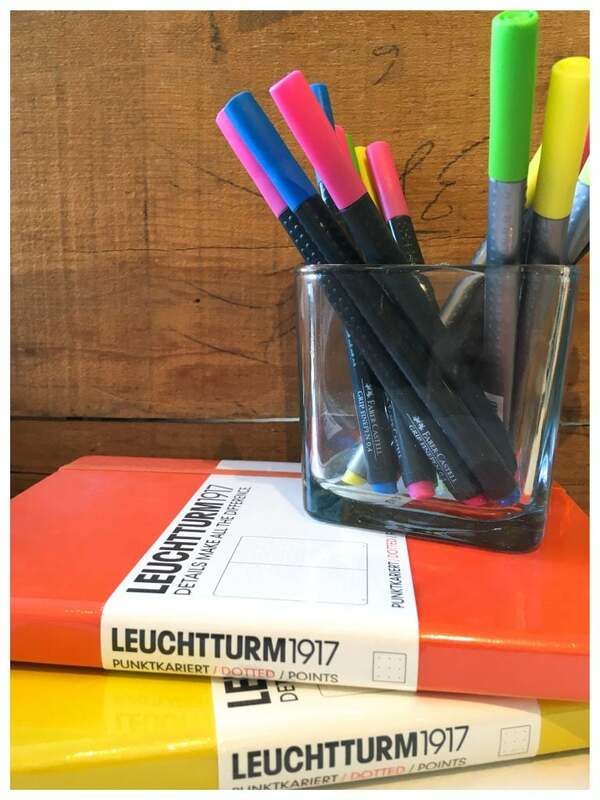 Our favourite to use is Leuchtturm. Bullet journaling does go deeper than that and if you stick with it, you’ll see a Bullet Journal is snapshot of who you are in that moment. To-do lists on a sticky note are great until you lose the list. Traditional Day Planners tend to plan your future. We record appointments, dinners and dates. Speaking from experience, dairies tend to focus on how you are feeling that particular day. I have many a diary that has taken a beating from a bad day. But a Bullet Journal does all of this and helps you to set up tasks and goals in a way that you can actually see progress. I will admit that my Bullet Journal has not taken the place of our giant paper calendar and as my kids get older and busier, Google Calendar is becoming increasingly handy in terms of knowing who needs to be where and at what time. But I will always and forever be in need of a paper notebook. And if you Google Bullet Journal, you will see tons of creative inspiration in how to set up your journal. I love that part. Bullet Journaling is hard to explain - showing you how to Bullet Journal is much easier! Sign up for a workshop! Shoot me a message here molly@villagequire.ca. In the subject line write - BuJo Workshop. I'll add you to a special email list and we'll set up a workshop date and you'll be the first to know the details.